They propel themselves by flapping these fins, as you’ll see below. (From Wikipedia): One of the highlights of the dive, a dumbo octopus uses his ear-like fins to slowly swim away – this coiled leg body posture has never been observed before in this species. The species are cosmopolitan but aren’t often seen because they live in the abyssal depths, often from 3,000 to 4,000 meters down. 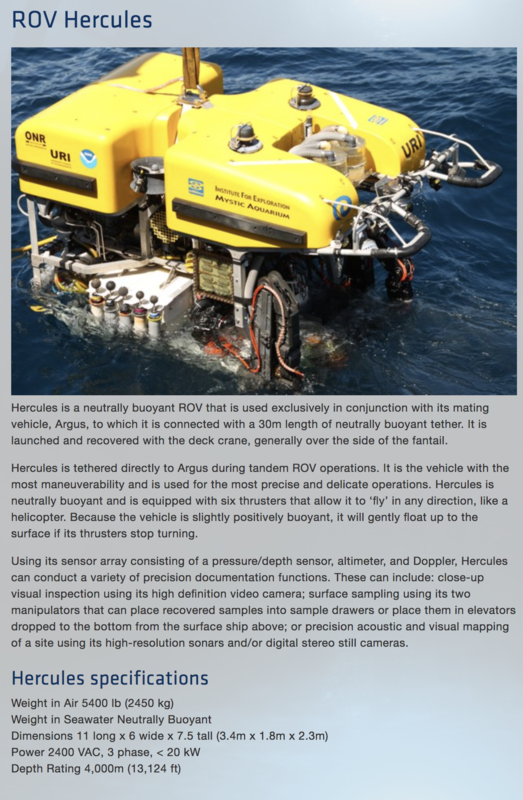 But one of them was just seen by the ROV (remotely operated vehicle) Hercules, which is run from the research ship Nautilus. The details below are from LiveScience, but the thing you’ll really want to see is the video. I love how excited the researchers get when, sitting on the ship above, they see this thing swim into view. The gentle dumbo octopus, also known as an umbrella octopus, is named for its ear-like fins that resemble the Disney character Dumbo’s oversize elephant ears. 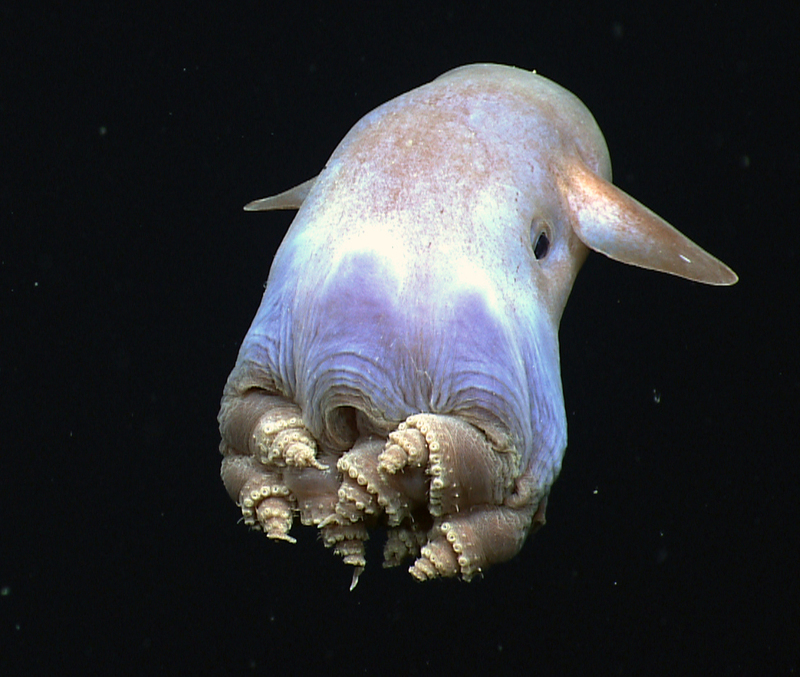 There are 13 species of dumbo octopuses, and most of them live at depths of below 9,800 feet (3,000 meters). They’re one of the rarest species of octopus, so catching a glimpse like this is pretty extraordinary. The team used scaling lasers on the ROV to estimate that this particular deep-sea ghost was just under 2 feet (60 centimeters) long, which is a little larger than most dumbo octopuses. The research ship Nautilus is funded and operated by the Ocean Exploration Trust, a nonprofit organization founded in 2008 by Robert Ballard. An ocean explorer and National Geographic explorer in residence, Ballard is best known for finding the sunken remains of the RMS Titanic. The goal of the E/V Nautilus is purely to conduct scientific exploration of the ocean floor. The group is now in its fourth year of ocean exploration. For the past couple of weeks, the Nautilus has been working with the Monterey Bay National Marine Sanctuary to explore an inactive, deep-sea volcanic mountain range called the Davidson Seamount. The area is about 80 miles (129 kilometers) southwest of Monterey, California, and has been nicknamed the “oasis of the deep,” as it hosts a wide array of deep-sea corals, sponges and numerous other invertebrates. But a few spots in the region remain unexplored, and that’s where the Nautilus has been sending its ROVs. Only a few days after spotting the graceful dumbo octopus, Hercules came across a massive octopus nesting ground, where more than a thousand deep-sea octopuses huddled in the rocks with their eggs. Find more incredible photos and videos of the octapalooza at Davidson Seamount on the Nautilus Live webpage. This entry was written by whyevolutionistrue and posted on October 30, 2018 at 2:00 pm and filed under animal behavior, invertebrates, molluscs. Bookmark the permalink. Follow any comments here with the RSS feed for this post. Both comments and trackbacks are currently closed. Dumbo is not a “Walt Disney” character. Dumbo is based upon a children’s story written by Helen Aberson and Harold Pearl,with illustrations by Helen Durney, that was prepared to demonstrate the prototype of a toy storytelling display device called Roll-A-Book, which was similar in principle to a panorama. It involved only eight drawings and just a few lines of text, and had Red Robin as Dumbo’s ally instead of Timothy Mouse. Of course few people remember who Helen Aberson was, any more than they recognize the names Carlo Collodi, Felix Salten, Charles Perrault, Ward Greene or Dodie Smith, all of whom were authors whose works were appropriated by Disney and are known mainly as his (non) creations. The baby elephant’s mother’s name is Jumbo. The baby’s name is Jumbo Junior. 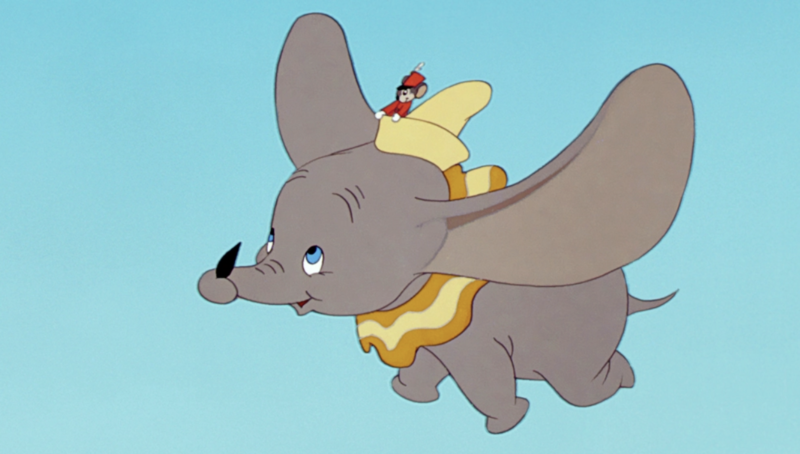 It is the mean characters in the movie – those older elephants in the circus – that name-call the baby “Dumbo”. And don’t forget what they took from Wilhelm & Jakob Grimm and Hans Anderson. And Disney dressed Pinocchio, a Tuscan character, with a Tyrolean (or Bavarian?) dress. Double cultural appropriation. I found Dumbo a dark depressing film . In the film “1941 ” Robert Stack in the role of General Joe Stillwell is shown to be in tears watching Dumbo . I have enjoyed watching the undersea exploits of Hercules at their web site. The narration and voices adds greatly to the experience. Thanks for reminding us of what’s out there in the interwebs. It’s surprising that they use 2400V three-phase AC power for a submersible. I guess three-phase power is common when working with high AC voltages, but such high voltages sure seem unusual for a vehicle. Anyone with more knowledge know why? High voltage reduces the volt drop in the umbilical and tether thus reducing overall losses. Speculation: To reduce the size of the transformers/rectifiers at the ROVs I assume it’s high frequency with twelve-pulse output allowing smaller smoothing capacitors. Guess – haven’t seen spec. I agree, it’s strange. 2400V does seem very high, especially in an environment where moisture might be present or where you might want to use battery back-up power (which would suggest low voltage). I don’t suppose it’s a misprint for 24V? And why 3-phase? Again, that’s only normally used in high-power heavy-current applications. It’s just a complication when dealing with small sensors and motors (and batteries) such as one would expect to find on a ROV like Hercules. THe power comes from the surface. You probably missed my comment published a few minutes before yours. I did miss your comment, and it would certainly be applicable to the supply to Argus. I’m still a bit puzzled why Hercules would get 3-phase power though. As I understand it you can get single-phase power just by taking any of the three phases and neutral, so why wouldn’t Argus just tap off one of the phases to feed Hercules? I’m absolutely sure all scientific instruments, cameras etc, run on single-phase supply (if not DC) so the reduction from 3-phase to single-phase has to occur at some point. See page 4 onwards of THIS PDF ~ E/V Nautilus has a level of electrical equipment complexity unimaginable last century because it’s HARD to run all that stuff without electrical distribution computer control systems that are a fairly new development for what isn’t a big boat – all this complexity & equipment variety with only 17 crew. Most ships until fairly recently run something like 3-phase A.C., 3-wire, 440V + lotsa human muscle. But, ships today are a lot more electrically dependent because motors, cranes, winches, computer systems, detectors, uplinks replacing traditional crew functions. PLUS this E/V Nautilus has extra small fore & aft propulsion units, workshops, science instrumentation etc. These very large electrical loads, that vary a lot during operation, require sophisticated distribution balancing to prevent problems. Therefore the tendency for shipping today is to go with three or more generators operating at high voltages of 3.3KV, 6.6KV & even 11KV for two of them & an auxiliary [backup] on the ‘old’ 440 VAC. These high voltages also reduce the size of cables & equipment – cables over 4 km & a potential future 6 km don’t forget. The ROVs have HV 2400 VAC [60Hz] delivered over up to 6 kilometres of cable [limited to 4km at the moment], this is converted at the ROVs [or maybe all or primary conversion occurs at ROV Argus which is never far from ROV Hercules] to 110 VAC [60Hz], 24 VDC, 12 VDC & 5 VDC. Conversion: The number of phases is irrelevant in AC to DC conversion EXCEPT when there’s a large power draw at the DC end – then more more phases for efficiency. When I see an octopus fly? I’ve seen a garden walk, and a parade rest…. … and the dollar slide. PZ Myers would get aroused at some of the images shown here. At the moment he is too busy breeding spiders. I really love all cephalopods, but this specimen takes the cake! I foreswore pulpo a la gallega, tako sushi and all other octopodiform culinary preparations years ago, but now I see I have to make penitence. Am I the only one to which this octopus reminds a cow’s head with something strange done to the snout?